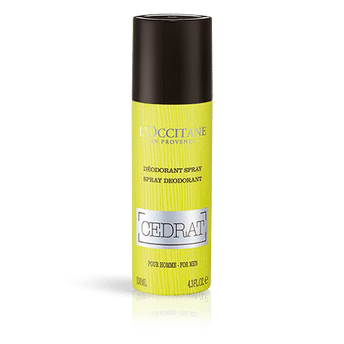 L'Occitane's Cedrat Spray Deodorant, scented with the sparkling notes of Eau de Cedrat, provides protection and freshness all day long. Its fresh, zesty fragrance reveals subtle spicy notes over a sensual, woody base. The skin feels protected against odors all-day long. Explore the entire range of Deodorants/Roll-ons available on Nykaa. Shop more L'Occitane products here.You can browse through the complete world of L'Occitane Deodorants/Roll-ons .